Another comic themed mani today. I'm hoping to go see the new Spider-Man movie. I can't believe I've not seen it yet, that's so unlike me! As I was planning to do this post I got the perfect red polish in the mail. Dollish Polish - Ms. Monroe. 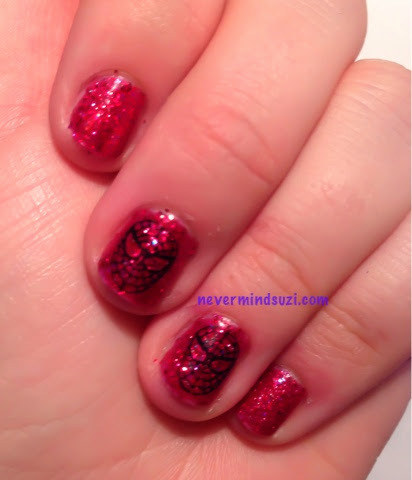 A Ruby red jelly packed full of red and holo glitters. It's got such a gorgeous sparkle. I've stamped my accent nails with Spider-Mans face. Funny thing is I could never get this stamping plate to work before and suddenly it does!